Thank you so much for making me so welcome, even though I arrived much later than I'd said and very late for an arrival. The breakfast was superb!! Good quality food and excellently cooked and such a choice of cereals and spreads. Your B&B is very much a home from home and I will certainly recommend it. Just a quick note to say how much we appreciated our stay at Foxhall Farmhouse. We found your B&B a wonderful, relaxing place and the location was ideal for us to explore some of the local surroundings, including some of the pubs you did recommend! Thank you for the past couple of nights at your B&B. With a wonderful breakfast starting the day off so well I have no hestitation in recommending you and look forward to the next time I stay. Such a refreshing change! A great B&B with everything we could ask for. Highly recommended. As a fishermans widow I find Foxhall Farmhouse a god-send. Barry can go off fishing and I can simply relax. The breakfast is always wonderful and there are many places to visit (in my case mostly shopping) for great days then we can meet back at your B&B in the late afternoon for a spendid evening at one of the local restaurants/pubs. We both look forward to our weekends with you immensely. As keen F1 fans we appreciate accommodation gets harder and harder to come by every year - good quality accommodation at reasonable price even more so. 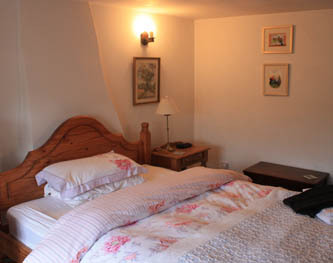 We find Foxhall Farmhouse perfect for our stay and would recommend it to everyone - although not too loudly otherwsie there would be no longer rooms for us!! Thank you for a wonderful weekend. We both enjoyed our 'getaway' so much and would recommend your B&B to all our friends. Your personal attention to detail and 'nothing was too much trouble' attitude was very much appreciated and no doubt contributed in such a huge manner to our suucessful trip. ...the wedding was lovely and your B&B was the perfect location to stay. The rooms were very well presented and the breakfast excellent. Thank you. A superb Bed and Breakfast - we shall be back soon!